Very nearly gave up with this one thinking it was a custom IC fault, glad I never. Was sold this board as a non worker, the guy said it boots to a white screen and the CPU needed to be looked at. Before I did anything that CPU needed socketed. 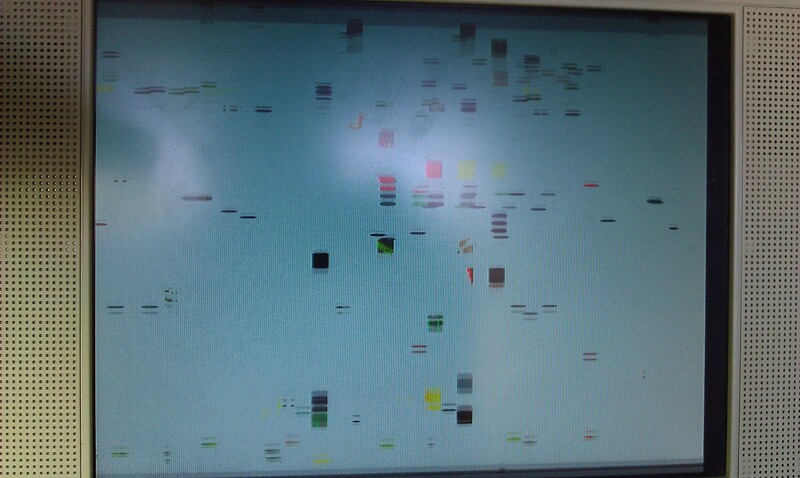 Once I had done that I fired the board up again but got the same white screen. I checked the data lines of the CPU and they were dead. 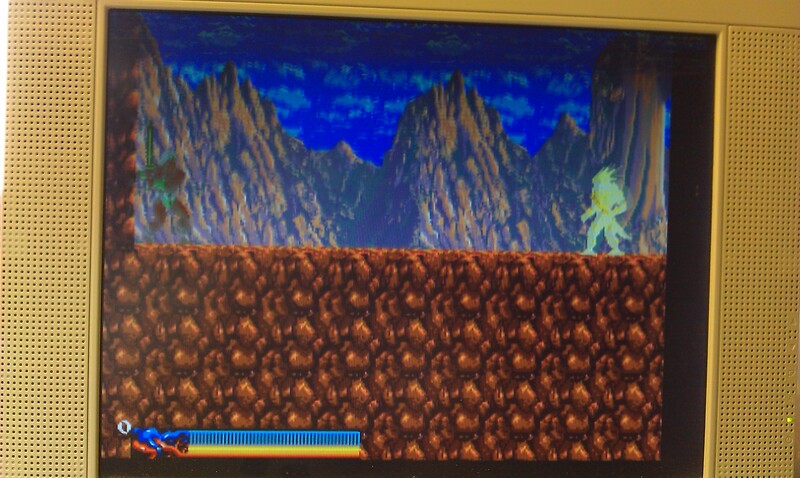 I initially tried a known good 68000 CPU but this resulted in the same screen. There are 6 ROMs next to the CPU which are the program ROMs. I pulled all these and checked them against MAME. 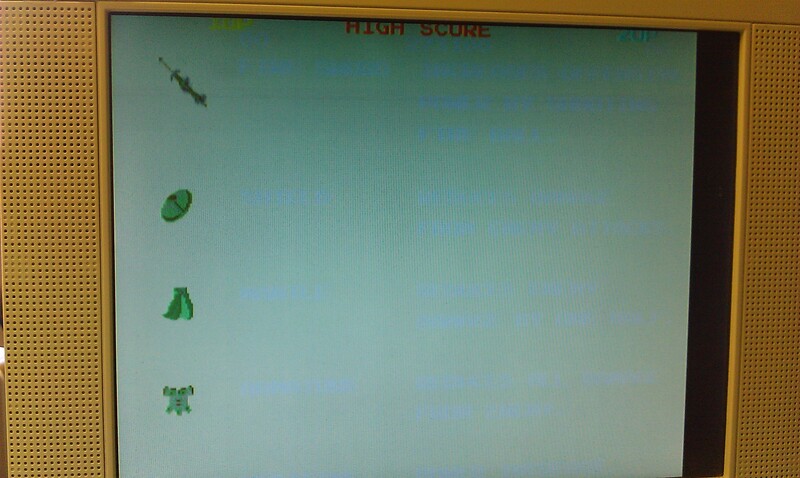 The first 3 checked were fine the last 3 were actually from an Operation Wolf board and 2 of those were dead anyway. 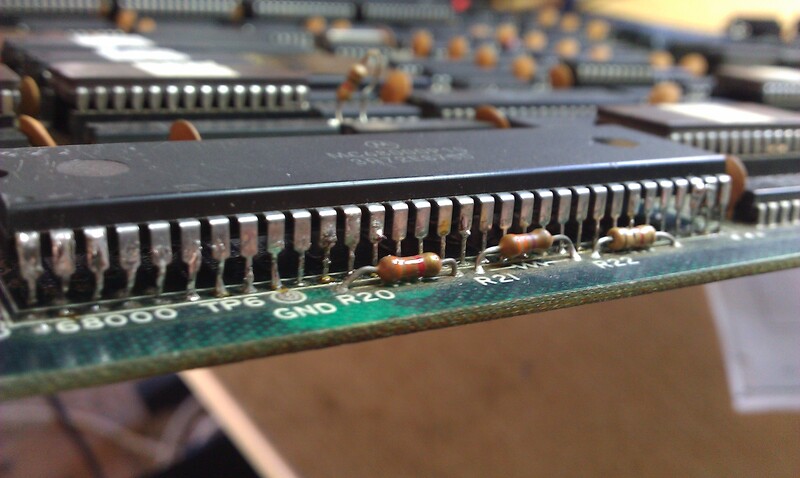 Burned 3 replacement 27c512 EPROMs and tested again. 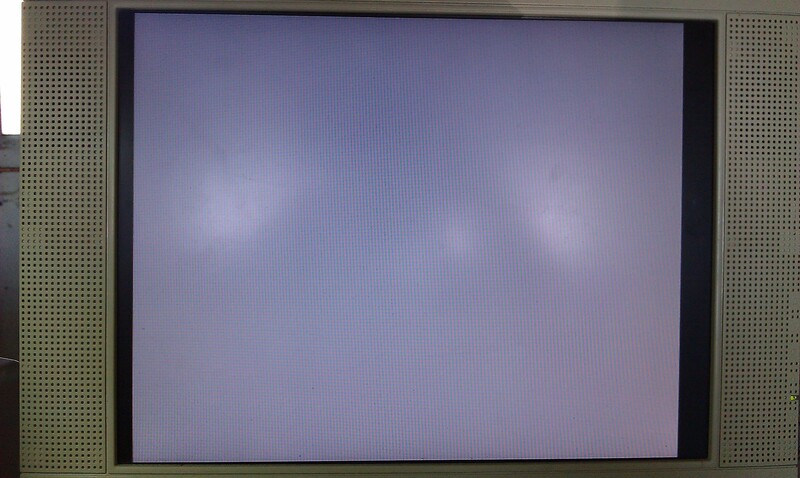 This time I got a white screen with some garbage on. After this I plugged in the Fluke 9010 and ran some ROM and RAM tests. The ROMs passed fine but one of the RAMs had failed. The TMM2063 @ IC10 was shot, I used a D4364 as replacement as its the first one I found compatible on a scrap board. Board still booted with garbage. All lines on the CPU had frozen. 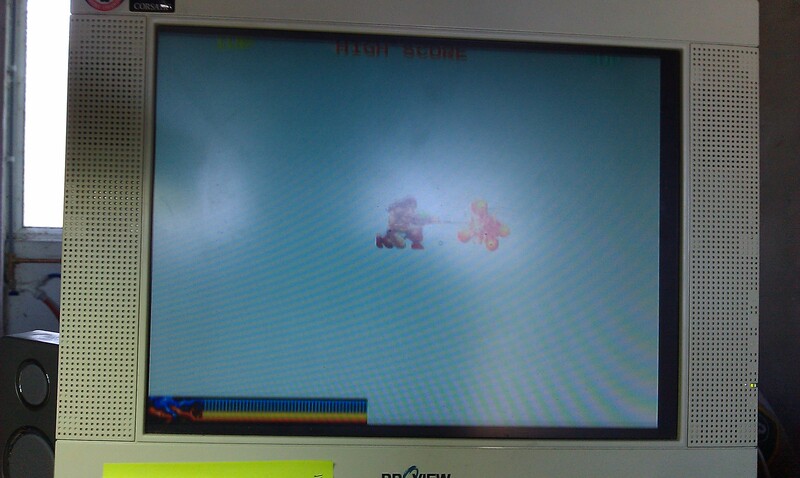 Checking the game running in MAME I could see that when you first boot the game the whole screen flashes white for a second then the game boots. I checked the 3 Interrupt line, IP0, 1 and 2, and found that IPL1 was dead, this came from a nearby PAL @ IC36. The PAL was giving an output so I ran a jumper wire to the CPU and booted again. 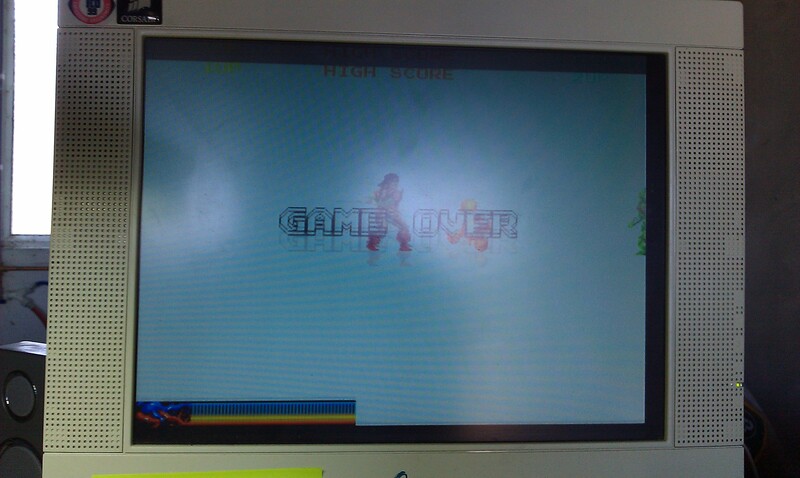 This time I got a full white screen with the Hi Score at the top and the game ran but only showing the sprite data. I checked all the ROMs that hold the background data and they all checked out fine. These are MASKROMs and can be read as either 27c301 or a couple of reads as 27c512 with a small modification. Following the data route from these ROMs I eventually came to a 74LS157 @ IC72. It had dead pins at #3 and #11. Pin 3 should go straight to +5v and pin 11 should come from address bus A10. Ran a couple of jumpers for these and got something a little different, the screen was still mainly white but I could see text underneath it and the sprite colours were now messed up. 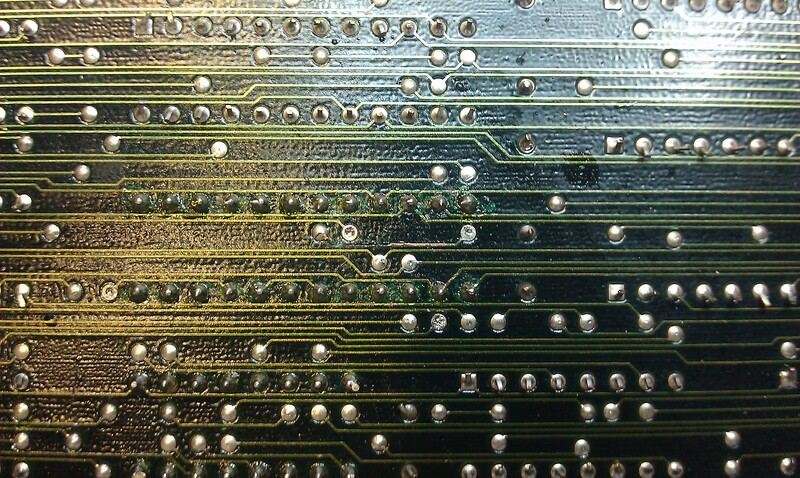 Looking underneath the board I found a discoloured track, when I ran the screwdriver over it, it came away from the board looking a little charred. Only a short jumper required but it was underneath the palette RAM. I started checking the palette RAM and found pin 16 was dead. I removed this 2018 RAM @ IC73 and it tested faulty, replacing this with a 6116 brought the graphics back fully.